Beauty of an accompaniment embraced equally well by rotis or rice. A delightful dish made with Brinjal, cooked or roasted, peeled and mashed making it awesomely aromatic; cooked tomatoes making it tangy; ginger, garlic making it gently pungent; spice powders making it spicier and onions marking a broad baseline of sweet and earthy flavour. The term “Bhartha” is used when ingredients are mashed roughly either before or after the dish is done. Baingan (also known as Badanekaayi, Brinjal, Eggplant, Aubergine, Guinea Squash, Melanzane, Melongene, Garden Egg) is a low calorie vegetable. Antioxidants present in the vegetable keeps the arteries healthy and prevents heart attack. Being rich in fibre, it helps clear toxins from the digestive tract, prevents colon cancer and prevents overeating since even a small serving makes one feel full. Its high water content also flushes the toxins away….making your skin glow the fairy way! Salt to taste 2 tbsps. approx. Cook brinjal in tandoor style for that distinct smoky flavour….greased in oil (with a few pricks all over for fast and uniform cooking) and roasted over an open flame on low setting till it is cooked well. Keep turning and cooking till the entire skin is charred, the inner flesh looks really soft, the skin starts curling and is in a ready to peel state. (hello “easyroutefinders”, cook brinjal in pressure cooker with water like you cook potatoes. Let it cool.) Peel the skin of onions and chop them fine. Pour oil (2 tbsps.) in a kadai. Heat the oil and put cumin seeds. When they splutter, add ginger garlic paste. Fry it and then put chopped onions. Add salt and turmeric powder. Stir well. Fry in low flame slowly. When onions have fried well, they would have reduced in quantity. Now put coriander (dhania) powder, cumin (jeera) powder, chilli powder and masala powder. Mix well and continue frying in low flame. Fried onions appear further reduced in quantity. Now add finely chopped tomatoes and continue frying. Meanwhile, try piercing the cooked brinjal with the back of a spoon. Did the spoon make its way in, just as it would into soft butter? Yes…now peel the skin of cooked brinjal. Open the brinjal into half. Make sure brinjal is not spoilt inside. Sure fire check systems in place…right? Now mash it and add to the onion tomato mix that is being fried. Mix well. Let it simmer for few more minutes. Switch off the flame. Garnish with finely chopped fresh coriander leaves. Baigan Bhartha is now ready. 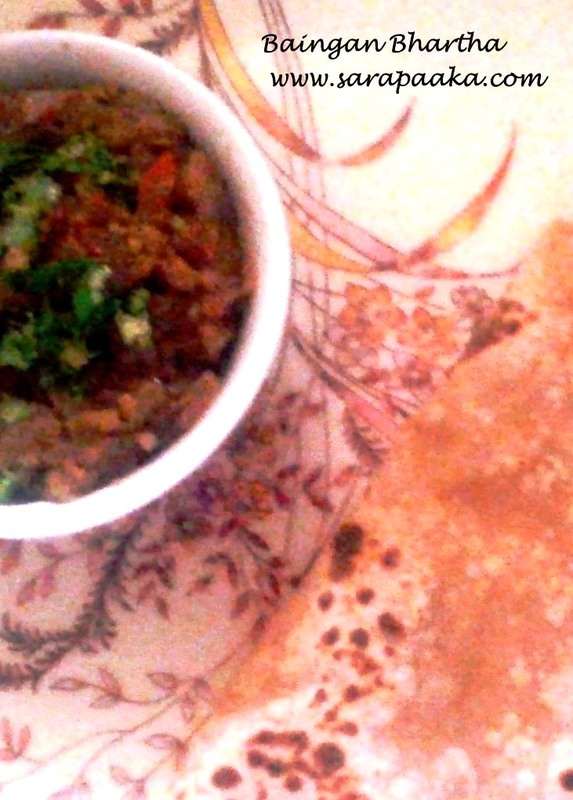 Serve hot with rotis, chapathis, phulkas, plain rice, jeera rice, crunchy toast…hmmm can’t resist! Brinjals that are big in size, with smooth and shiny surface are more likely to have lesser number of seeds. Pick the ones that look firm, shiny, healthy, heavy and solid. Check to see if the stalk is green, firm and stout. The whole vegetable including its skin and small, fine seeds are edible. It is preferable to use a stainless steel knife to cut brinjals since it prevents the chemical reaction between phytochemicals present in brinjal and the metal. If you have itching problems et al, don’t go dying for brinjal.